A baby’s cry filled with pangs of hunger is what a mother hears naturally during the first few years of motherhood. What Devesh’s mother heard for the first 3 months of her dear child’s life was only the cry of pain. So much that Devesh did not even have the energy to in his body to cry and his mother could not distinguish if it was milk that he wants or is it the acute heart condition that made him blue all day. Devesh was 3 months old when his distraught parents brought him to JKC, Vrindavan is a desperate bid to find out why their little one was crying all day incessantly and wasn’t drinking milk like a normal child. At the heart camp, he was diagnosed with an acute heart condition with a congenital hole and a pulmonary disorder that mixed good and bad blood. To add to his woes, he had severe and recurrent pneumonia due to his heart condition. It was a near hopeless situation for the young child and his parents. It was impossible to know if the agony of the parents more in comparison to the suffering of the infant. There was little hope for a child with such a difficult heart condition. Hundreds and thousands of people had arrived at the heart camp in mid Nov 2017 at JKC, Vrindavan which was free for all. Almost every patient was from the impoverished section of the society with little or no means to health care. Devesh was one of those patients in dire need of critical and advanced treatment with money enough to buy a few bottles of glucose. Devesh’s diagnosis was done by Dr. Khanna, a renowned and illustrious Cardiologist from Delhi. 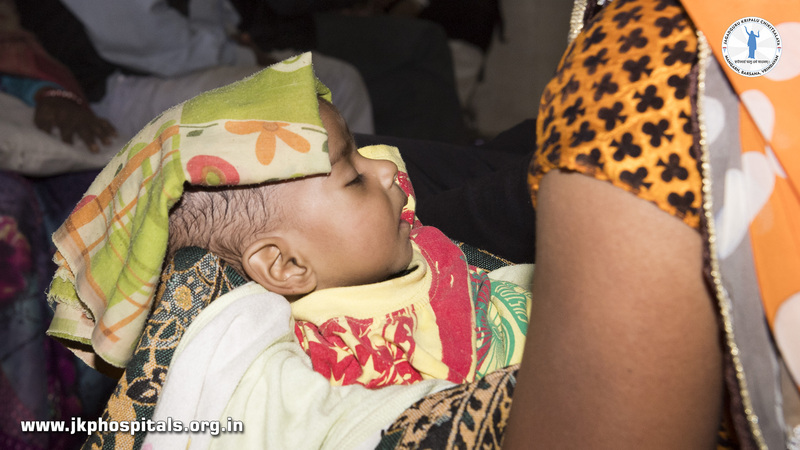 With JKC’s support, Devesh was immediately taken to Apollo Hospital in Delhi for an emergency heart surgery. Devesh’s condition worsened while he was in critical care unit when he suffered from renal failure as well as breathing complications. The doctors worked tirelessly to bring him out of both these threatening situations and successfully completed the heart surgery on Devesh. Within days, he recovered and after a few weeks, was almost as active as a normal child. What Devesh got was a gift of life from God. Jagadguru Kripalu Chikitsalay, a free hospital managed and run by Jagadguru Kripalu Parishat touches hundreds of lives everyday by providing free healthcare to all sections of the society and most importantly to the ones with no financial means to quality health treatment. Jagadguru Shri Kripaluji Maharaj established JKC as part of his worldwide mission. His divine personality has touched millions of lives in different ways and JKC has continued his work by helping and saving lives such as precious little Devesh, whose only cries now are for a mouthful of mother’s milk.